A flavorful and filling soup topped with all the fixings. 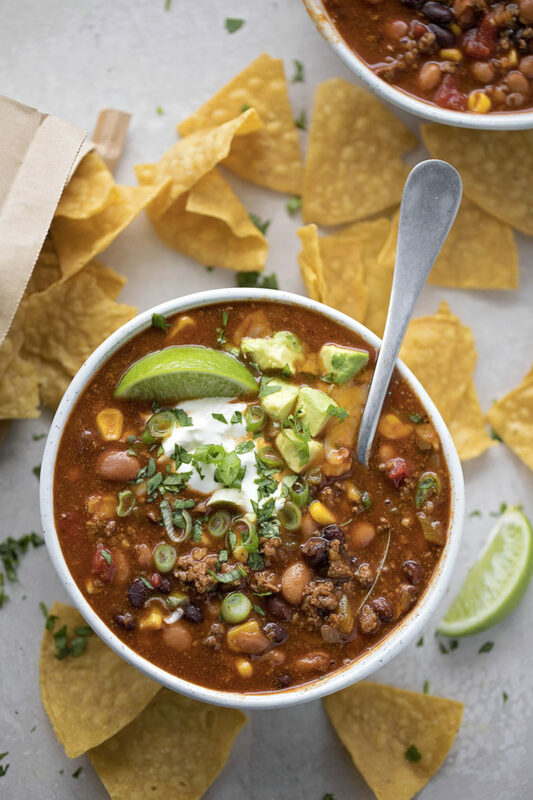 This easy taco soup is one of our go-to dinners. 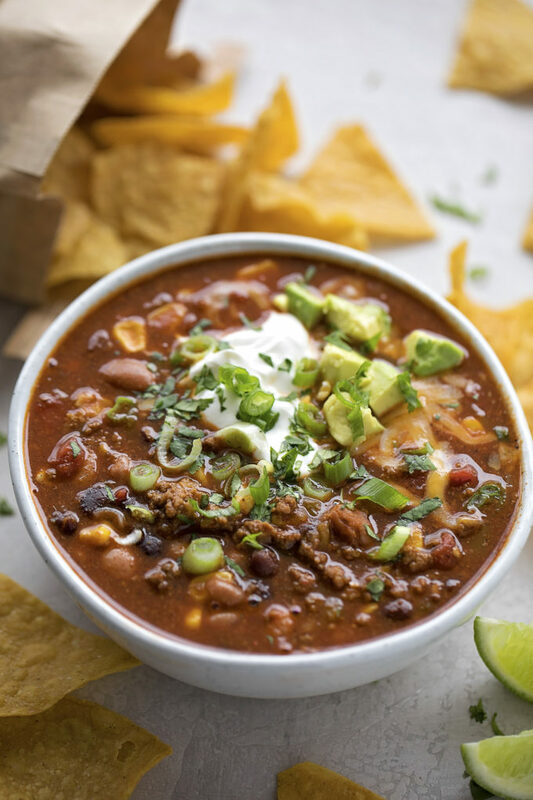 It’s a delicious, Mexican-inspired twist on traditional chili. One of my favorite things to make for dinner during winter is soup. Our son loves chili, so we make that almost weekly. I like to switch it up from time to time depending on what’s leftover in the fridge and pantry. When we have enchiladas or tacos we always have some cilantro and green onions to spare. Instead of letting them go to waste I grabbed them, along with some frozen corn and a can of diced green chiles, and made this insanely flavorful chili. While this chili may look complicated, it only takes about 15 minutes to prep and 15 minutes to start. The stovetop takes care of the rest. It’s perfect for chilly nights, busy nights, or when you need to feed a crowd (because doubling it is super easy). To start you’ll want to grab a large stockpot or a dutch oven. I always use one of my large enameled Le Creuset ovens when I make soup. It cooks anything and everything like a boss. While it’s definitely an investment piece, it’s well worth it! Place it over medium heat, then add the oil. You can use any oil you have on hand, I generally grab avocado oil when making Mexican food or when using high heat because of its smoke point. When the oil is hot, add the corn and saute. The corn should start to brown in spots, which is what we want. Color = flavor. Add the onion, continue cooking, then add the ground beef. Do you have to use ground beef in chili? Ground beef is traditional, however ground turkey or chicken would be delicious as well. Once the meat begins to brown, add in the minced garlic and the seasonings. 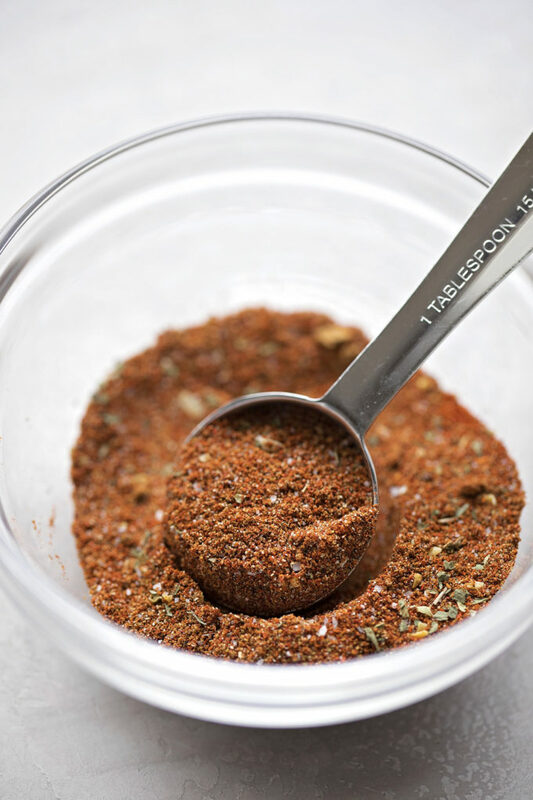 For this recipe (and pretty much all of the recipes you’ll find on LMS) you’ll make your own taco seasoning. It’s quick, easy and preservative free. Can I use a package of taco seasoning for this soup? If you don’t have some of these ingredients on hand you can certainly use a package of taco seasoning. There’s no shame in that! The key here is adding the seasonings BEFORE you add the liquid ingredients so that they get toasty, but not burnt. This is often referred to as blooming. It’s done to enhance the flavor of dried spices. 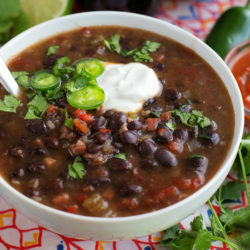 Add a can of diced green chiles (you can use whatever heat level you prefer), petite diced tomatoes, tomato sauce, chicken broth, black beans, pinto beans, and lime juice. Let the soup simmer, uncovered, for 2o minutes. It should thicken slightly by then. Remove from the heat and serve. Garnish with all of the fixings! 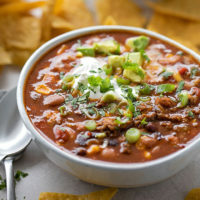 What should I garnish taco soup with? And of course, serve with a healthy handful of tortilla chips. 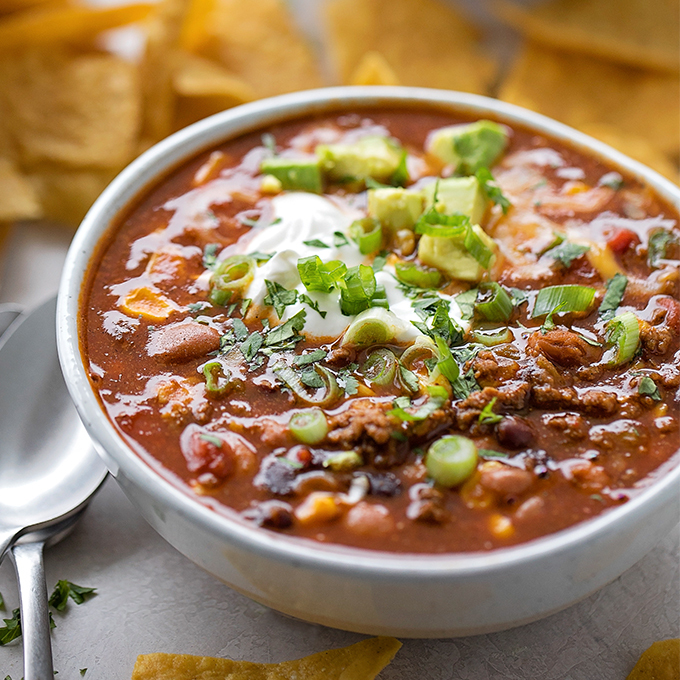 Because that added saltiness and crunch makes this easy taco soup even more amazing! 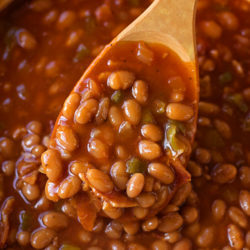 If you’re looking for a quick, delicious soup, this is one you’ve gotta try! It’s one our family looks forward to having and our kids request on a regular basis. Enjoy! 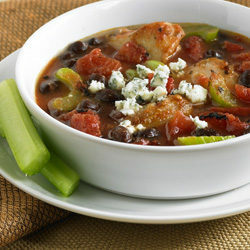 A flavorful and filling soup topped with all the fixings. This easy taco soup is one of our go-to dinners. 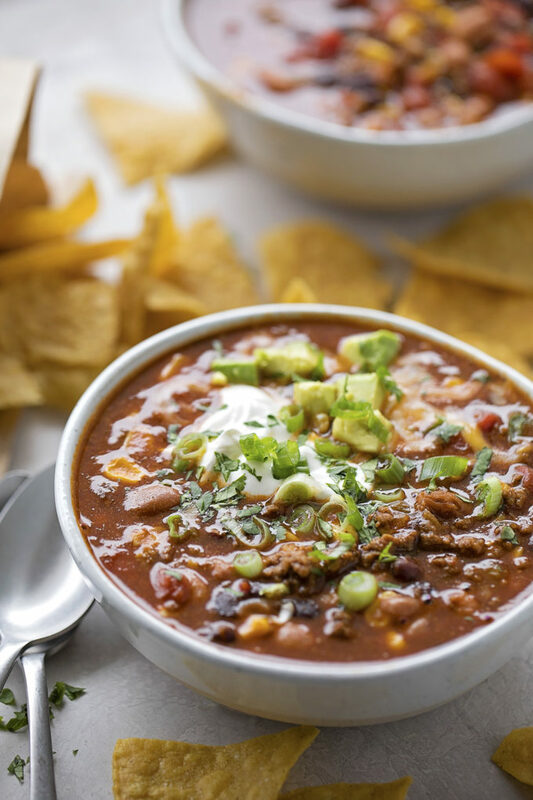 It's a delicious, Mexican-inspired twist on traditional chili. In a large stockpot or dutch oven set over medium heat, add the oil. Once the oil is hot, add the corn and saute for 5 minutes, then add the onion and saute for an additional 3 minutes. Add the ground beef and break into small pieces. Let the beef brown for 5 minutes, then add the garlic along with the chili powder, salt, cumin, coriander, garlic powder, paprika, and oregano. Cook for 2 minutes, stirring occasionally. Add the chiles, diced tomatoes, tomato sauce, beans, broth and juice of 2 limes. Bring to a simmer. Cook for 20 minutes or until slightly thickened. Remove from the heat and garnish bowls with desired toppings. *If you have kids that aren't fond of large chunks of tomatoes, you can chop them up with a knife or pulse them in a mini food processor to make them smaller. The chicken broth isn’t on the ingredient list. I added 1 1/2-2 cups and that seemed about right. (Will add more later if necessary) It tastes great! Easy Sunday night supper, making cornbread and salad to go with. Thanks for catching that Diana! I’m always writing these late at night which means I tend to forget a few things. This looks so good 😊 I love how you toasted the spices, will definitely try that! 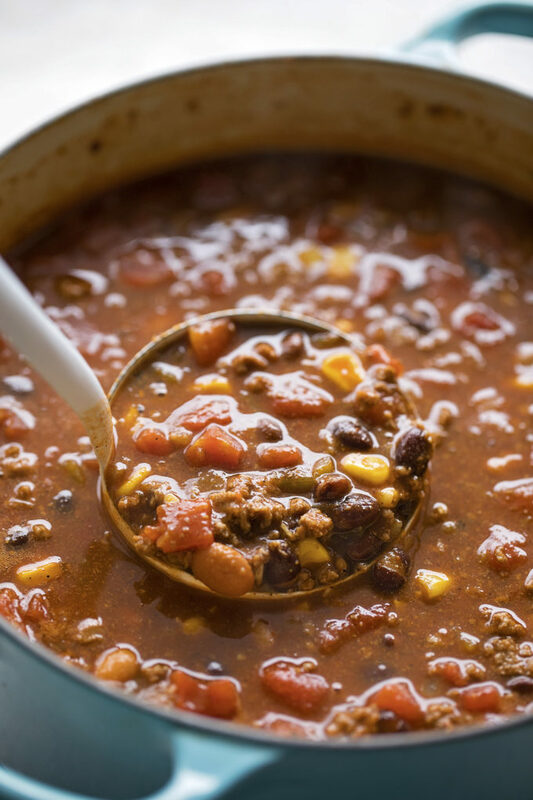 It’s currently snowing in RI and this looks like the perfect cold weather chili. I’m definitely going to try this soon! Looks like it would be delicious…and easy to make!